The far-right candidate in Brazil's presidential election, Jair Bolsonaro, is to have more major surgery after he was stabbed during a campaign rally on Thursday. His doctors said the 63-year-old remained in intensive care following the attack by a lone assailant. He suffered a deep and life-threatening wound to his intestines and lost 40% of his blood. He will be confined to either hospital or his home for several more weeks. The news comes as a setback to Mr Bolsonaro as on Sunday, doctors had said his condition had "improved markedly" and he was spending more time out of bed. 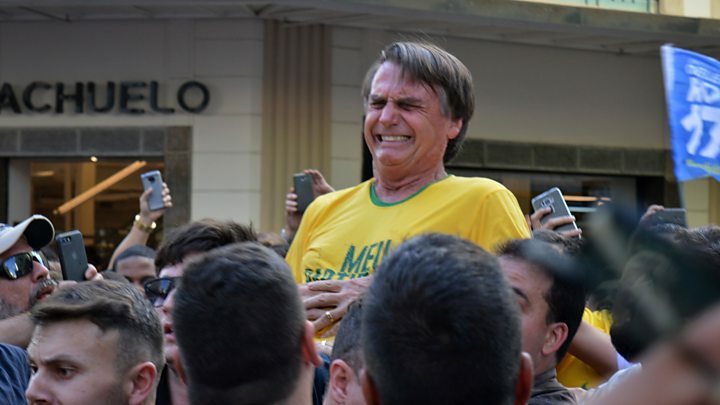 With the first round of the presidential election less than a month away, it is highly unlikely Mr Bolsonaro will be able to take part in any campaign events. A poll by BTG Factual/FSB suggests Mr Bolsonaro's chances of winning the first round increased following the stabbing, with 30% of those asked saying they would vote for him, up from 26%. But a Datafolha poll only had him increasing from 22% to 24%, which is within the margin of error. The same poll suggests that the far-right politician's rejection rate has increased from 39% to 43%. Mr Bolsonaro of the Social Liberal Party (PSL) is a divisive politician whom some analysts have compared to US President Donald Trump. His homophobic and misogynist comments have caused outrage among many Brazilians but he enjoys the backing of millions of evangelical Christians who praise his anti-abortion stance. The Datafolha poll suggests he would comfortably win the first round with an 11-point lead over his nearest rival, leftist candidate Ciro Gomes. However, according to a number of opinion polls, he looks set to lose should there be a run-off, which happens when none of the candidates receives more than 50% of the votes. Former President Luiz Inácio Lula da Silva, who until recently was well ahead with 39% in the polls, is widely expected to pull out of the race later on Tuesday. Lula, who is in jail serving a 12-year sentence for corruption and money-laundering, has been barred by Brazil's highest electoral court from running. His legal team is still appealing against the decision but sources close to his Workers' Party told Reuters news agency that he would announce on Tuesday that his running mate, Fernando Haddad, would replace him. Mr Haddad has been trailing in the polls with only 4% but his support jumped to 9% in Monday's Datafolha poll.